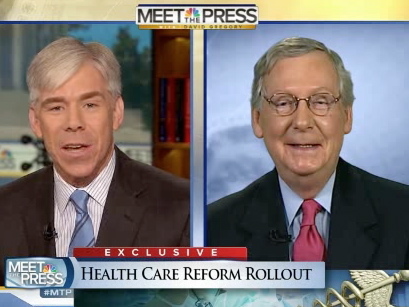 David Gregory Upset McConnell Keeps Calling Obamacare A "Bill" and Not A "Law"
SEN. MITCH MCCONNELL: Well, the president himself seems to not think parts of the law ought to be implemented. I mean, he is selectively delaying parts of it as if it's all just kind of a smorgasbord of options for him to figure out, you know, which ones to execute, and which part of the law not to. DAVID GREGORY: Well, but a delay is not a failure to execute. A delay is not a failure to execute. DAVID GREGORY: But, Leader, it's not a bill. But you support the democratic process. This is not a bill. This has been passed. SEN. MITCH MCCONNELL: I know that it's a law. DAVID GREGORY: This is the law of the land. DAVID GREGORY: You refer to it as a bill. Doesn't that undermine -- I mean, if the shoe were on the other foot and it were a law that was passed by Republicans in Congress, would you not refer to it as the law of the land and want to see it implemented as best it could be, despite the fact you disagree with it? SEN. MITCH MCCONNELL: Well, of course it's the law of the land. And I wonder why the president himself is delaying various parts of it. He, you could argue, is not executing or implementing the law that he thinks is such a wonderful thing for the country. Carney: Critics Of Obamacare Employer Mandate Delay Are "Willfully Ignorant"
Sen. Harry Reid: "Obamacare Has Been Wonderful For America"